This is an OpenSource Project that I have been waiting for long time. It is mainly for 5G Radio System. Even though no 3GPP specification about 5G is available, this project will contribute a lot in 5G community. Refer to OpenAirInterface home page for the details. OpenAirInterface (OAI) Software Alliance aims to further the software towards future 3GPP releases for 5G. The main goal of the alliance is to create an ecosystem of industrial/non-profit/academic organizations to implement reference solution for 3GPP standards. The OAI is striving to become a tool used by both the industry and academic for using community driven development to accelerate innovation in 5G wireless technologies, and to bring the huge economic success to this part of information technology. The OAI targets a reference implementation of ‘Release 14 LTE’ based on the current 4G implementation and to progressively add enhancements from 3GPP study items defining the future 5G standard. OpenAirInterface is an open source implementation of 3GPP stack. It covers different parts of 3GPP stack (eNodeB, UE, MME, HSS, S-GW, P-GW). The software runs on general purpose computing platform (for ex. 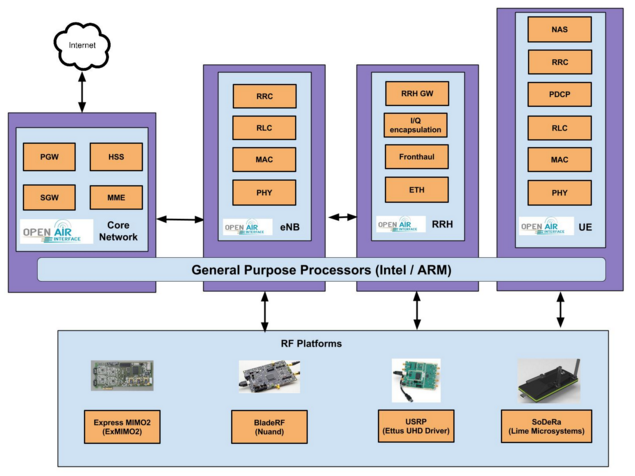 Intel/ARM) and interfaces with wide variety of SDR platforms (EXMIMO, USRP, BladeRF, LimeSDR). The OAI currently implements Rel 8/10 stack for eNB/UE/EPC. It runs on standard Ubuntu Linux 14.04 LTS with low-latency kernel for eNB/UE. OAI requires Intel processors which support (SSE3/SSE4), however support for AVX2 is optional. It is also a requirement to have USB3/PCIe on a PC which interfaces with SDR platforms (USRP, BladeRF, EXMIMO and LimeSDR). The code compiles with standard GNU toolchain that comes with Linux. OAI can be also run in simulation mode (oaisim), the details of which are provided by Open Air Usage tutorials on the gitlab server@EURECOM. The OAI software packages used to deploy an operator’s core network, the Enhanced Packet Core or EPC, are collectively known as openairCN while the access network software for base stations and terminals goes under the name of openair5G. The EPC is quickly being integrated with other open source software packages providing telecommunication services and solutions for network management (e.g. openIMS, Clearwater IMS, OpenDayLight, Open Source MANO (OSM), OpNFV) on the generic cloud computing platform OpenStack. To ease integration with OpenStack software packages, and because revenues from the EPC are less dependent on intellectual property agreements, openairCN is distributed with a standard Apache V2.0 license, which is quite common in cloud computing software. 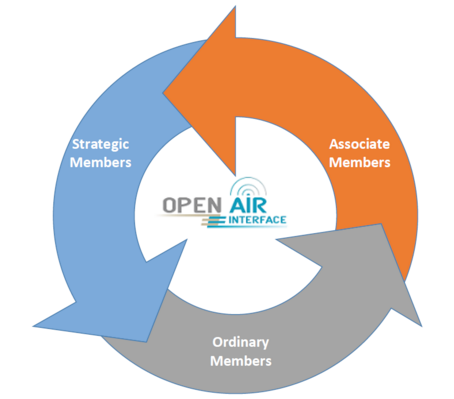 The access network software openair5G, on the other hand, is freely distributed by the OAI under the terms stipulated by a new open source licence, the OAI Public License, catering to the intellectual property agreements used in 3GPP and allowing contributions from 3GPP members holding patents on key procedures used in the standard. The OAI is working closely with ETSI to harmonise the software licence with the intellectual property policy of 3GPP. The end result is that groups can use the software as any Apache V2.0 software for non-commercial purposes (e.g. for study and research) while for commercial exploitation of the community software, users are bound to respect intellectual property agreements associated with the 3GPP standard as with proprietary hardware and software. For details on OAI licensing model, please refer to OAI License Model page. Since, the evolution of 5G is still under discussion within academia/industry, we plan to identify different areas in which different members of the alliance create projects. The projects are created with the goal of furthering these strategic areas within the alliance and making sure the output of the project is merged back with the main repository at some point. The strategic areas of the alliance ratified by the board are listed here. In order to install OAI successfully, it is important to follow HW/SW requirements. Almost all the technical documentation is hosted on EURECOM gitlab server. The entry point for wiki for openair5G is OAI Wiki/Home and the entry point for openairCN is OAI-CN Wiki/Home is here. There are several tutorials inside Gitlab page to run OAI in various modes (Emulation, Simulation, real-time with COTS UE, etc). The mailing lists for both user and developer community is OAI Wiki/Mailinglist. The gitlab workflow/coding guidelines/contributing guidelines are here. OAI hosts several training/workshops periodically for roadmap discussions with the community and also to train the community regarding the software implementation. For more information, refer to OAI Community/Workshop. The Alliance offers several membership models for companies, non-profit institutions and individual contributors. The membership is free for individuals/non-profit organizations, however there is fee for corporations. For more info regarding membership, refer to OSA/JoinUs. Q1. Can OAI implement both eNB (and core network) or UE ? [Ans] OAI implements both eNB and core network (MME,SGW,PGW,HSS) as well as UE. Q2. Is there any operating system requirement ? (What type of linux ? what version ? etc) What is Operating System details that has been verified by OAI developers. Q3. Is there any requirement for PC running the simulator ? Q4. What kind of hardware can be used to run OAI and what are those which has been verified by OAI developer ? [Ans] Yes, but we have not tried it. OAI needs to be ported to ZynQ to run on USRP Embedded series. Q4-3. What is the most recommended URSP series/model for OAI ? [Ans] There are additional libraries required but they are installed automatically by OAI scripts (Refer to OAI Autobuild for details). Q6. Is there any specific compiler requirement ? [Ans] Yes, it has a simulation mode called oaisim (Refer to OIA Wiki/OpenAirUsage for details). Q8. Which LTE Bandwidth is supported and really verified ? Q9. Which TM (transmission Mode) are supported and really verified ? [Ans] TM1 and TM2 as of now (Apr 2016). Other TM is being developed now. Q10. What is the maximum MCS and maximum RB that has been proved working (for 5Mhz, 10 Mhz BW) in OAI system ? In DL MCS 28 will work fine. UL MCS20 also fine, 5/10 MHz. Transmission Mode is all TM1.